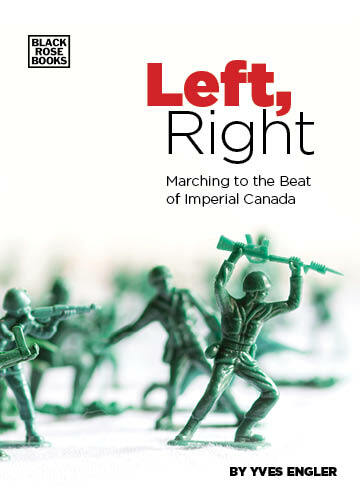 As a researcher and writer largely focused on Canadian foreign policy I was surprised to be profiled by a right wing US magazine and downright amazed when the story was tweeted out by renowned French imperialism apologist Bernard-Henri Lévy. What’s curious in this, and other smears, is I’ve done as much as any author in recent years to draw attention to real anti-Semitism in Canada. I’ve highlighted McGill’s quotas on Jewish students in the 1920s, 30s and 40s; medical students at Notre-Dame Hospital striking in 1934 to block a Jewish student from taking up a senior internship; the 1933 Christie Pits Riot where Jewish youth fought back against fascist thugs terrorizing non-Anglo-Saxons; “none is too many” immigration policies; prejudicial land covenants targeting Jews and others into the 1950s. Additionally, I’ve detailed the multiplicity of forces driving Canadian support for Israeli policy, which undermines the notion its entirely about Jewish Zionist lobbying, an idea that at its most extreme, can veer towards a stereotypical trope. But, this commentary is not a defence of my writing. Anyone interested in the merits of the slanderous claims against me can pick up Canada and Israel: Building Apartheid or read my articles online to make up their own mind. What’s worth discussing in this attack is the organizational and financial ecosystem from which it emanates. “It’s Time to Talk About Yves Engler” was written by a York University student affiliated to the Committee for Accuracy in Middle East Reporting in America (CAMERA), which is a rabidly pro-Israel ‘flack’ group. Author Ben Shachar is a CAMERA Fellow, which means he attended a “four day all-expensed-paid annual summer Student Leadership and Advocacy Training conference in Boston” and receives a US$1,000 stipend if he “publishes at least four educational and informational Op-Eds or letters-to-the-editor”, distributes CAMERA materials, organizes an educational event about Israel covered by student media, monitors Israel discussion on campus notably “tracking all relevant class curriculum offered at your university.” If a school doesn’t already have one, CAMERA Fellows’ are encouraged to form an Emet for Israel group, which can access “thousands of dollars in resources for speakers, films, and other programming” promoting Zionism. While not forthcoming with information, the Maccabees have reportedly spread to a couple dozen universities. According to a 2016 Los Angeles Times story titled “How a casino tycoon is trying to combat an exploding pro-Palestinian movement on campuses”, the Maccabees paid for “Stop the Jew Hatred on Campus” campaigns at a half dozen California universities. Contracted by Adelson’s group, the David Horowitz Freedom Center plastered posters around UCLA labelling sixteen Students for Justice in Palestine members “Jew Haters” and terrorist allies. It’s unclear if Adelson’s initiative has funded any Canadian-specific activism, but there’s a web of organizations operating in this country that pursue similar work. In January an individual with Hasbara at York who is a former StandWithUs Canada Emerson Fellow criticized one of my essays in a piece for B’nai B’rith. The Canadian Council for Israel and Jewish Advocacy, which later dissolved into the United Jewish Appeal’s umbrella lobbying organization Centre for Israel and Jewish Affairs, was established in large measure to combat pro-Palestinian activists at Concordia, York and other universities. Immediately upon its establishment in 2004, CIJA contributed more than a million dollars to campus activism, including hiring “advocacy experts in seven Canadian cities, who assist local student groups and address anti-Israel agitation on campus.” The funding also subsidized visits to Israel and trained students to promote that country. Part Jewish cultural organization and part Israel lobby group, Hillel receives millions of dollars a year from United Jewish Appeal Toronto, Montréal, etc. and other Israeli nationalist sources. In addition to Hillel and CIJA, B’nai B’rith attacks Palestine solidarity activism from its half dozen offices across the country. With an $8.6 million budget in 2015, Friends of Simon Wiesenthal Center Canada also regularly labels Palestinian solidarity activists “anti-Semitic”. Dozens of registered Canadian charities, ranging from the Jewish National Fund to Christians United for Israel to the Association for the Soldiers of Israel, engage in at least some pro-Israel campaigning. On the Palestinian solidarity side it’s a different story. Independent Jewish Voices has one poorly paid part-time employee while Canadians for Justice and Peace in the Middle East has another. The vast majority of Palestine activism is volunteer work. Few of those engaged in it are compensated financially. Nor are there future employment prospects, which exist in “Jewish communal” institutions for Israel campaigners. I considered pursuing Shachar or Algemeiner for slander but decided it was more important that people “Talk About” my writing and if that’s not possible at least my “diseased brain”. Also I wouldn’t want them to remove the picture of my book Canada in Africa: 300 Years of Aid and Exploitation that accompanied the story about me. Maybe some Israel apologists who follow Algemeiner or Bernard-Henri Lévy will read up on Canada’s role in impoverishing the continent.